Dundee retailer Mohammed Shafiq has been trading as a Best-one for a year, and his store is a masterclass in modern merchandising, divided into areas based around the time of day, which has resulted in happy customers, and a happy retailer. 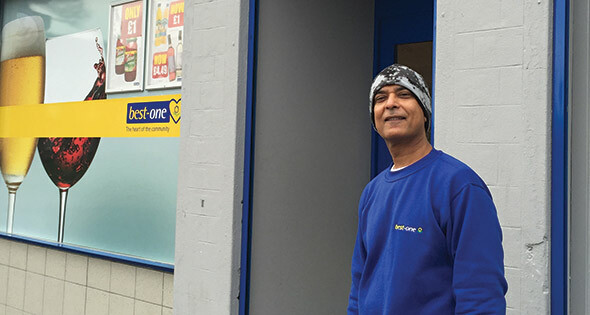 After 14 years running an unaffiliated store in Dundee, Mohammed Shafiq in early 2014 decided it was time for a change. Based on feedback from his customers he knew he had to expand. That wasn’t possible in his current location, but he also owned the property nearby and so served notice to two tenants – a charity shop and a hairdressers – and began to speak to symbol groups. “I know everyone in the area, so they’re always good to provide feedback on what I could do better. They said I needed a bigger range and more variety. My old shop was only 400 sq ft so I couldn’t do it there,” he says. A wall dividing the two previous units had to come down and new floors, ceiling and even a roof was installed before Shafiq started to work with Best-one on the layout of the store. And this is where the magic began. The store is oddly shaped, almost L-shaped, but rounder. It’s certainly not a box. “I thought the shape would have been a negative point, but the more we discussed it, the more we realised how we could work it to our advantage,” says Shafiq. The idea was to look at mission shopping principles and divide the store into three distinct areas for morning, lunchtime and evenings. The smaller spine of the store is its morning section where you can find confectionery and crisps. Food to go sandwiches share a fridge with fresh juices and energy drinks, next to morning rolls and news and magazines. The middle area of the store is covered by the same confectionery and crisps fixtures, but includes a chiller with Rustlers burgers and soft drinks, next to a microwave and coffee machine. The main spine contains grocery, chilled and a hugely impressive soft drinks fixture with a fully kitted-out BevtRac system. All chillers – including beer and wine – are closed doors. Shafiq reckons it’s this side of the shop that customers turn to in the evening, so it is here that you’ll find bread and milk. “People in here tend to pick it up after work, so it made sense for bread and milk to be next to the grocery,” he says. Not only does Shafiq have milk at a highly competitive price, but he has a permanent multi-buy promotion on bread and milk, which includes a hand-made point of sale on the door, and next to the bread – which is located next to the milk chiller. Either two four-pint jugs or one two-pint jug and a loaf for £2. Overall, the ranging and merchandising is flawless, it’s carefully thought out, but it’s this innovative approach that makes Shafiq’s store stand out. The corner location helps too. It straddles five different streets and is visible for quite a distance, meaning Shafiq is also getting more passing business. Like all retailers there’s nothing Shafiq can do about the tobacco display ban, however when that’s the only aspect of your shop that you’re not happy with then you know you’ve done something right. Shafiq certainly has. The decision to move to a bigger unit incurred a major investment, but that’s paying off with every transaction put through the till. The decision to merchandise the shop based on time of day is inspired and highlights just how progressive independent retailers can be.